2016 presidential candidate Donald Trump called out Senator Bernie Sanders Tuesday for allowing #BlackLivesMatter activists to shut down a rally in Seattle on Saturday. Sanders, a Democratic presidential candidate, allowed two women to take the microphone and take over the rally. 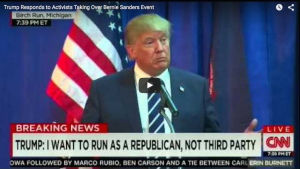 Sanders would end up leaving the rally, after being unable to regain control of the stage. But on Twitter in the moments following The Donald’s bombastic remarks, #BlackLivesMatter tweeters said they were ready to rise to the challenge.